I've been using this method to be an effective sentry and a casual Roleplayer on the Borderlands. I shall use the southeastern corner as an example of this method. 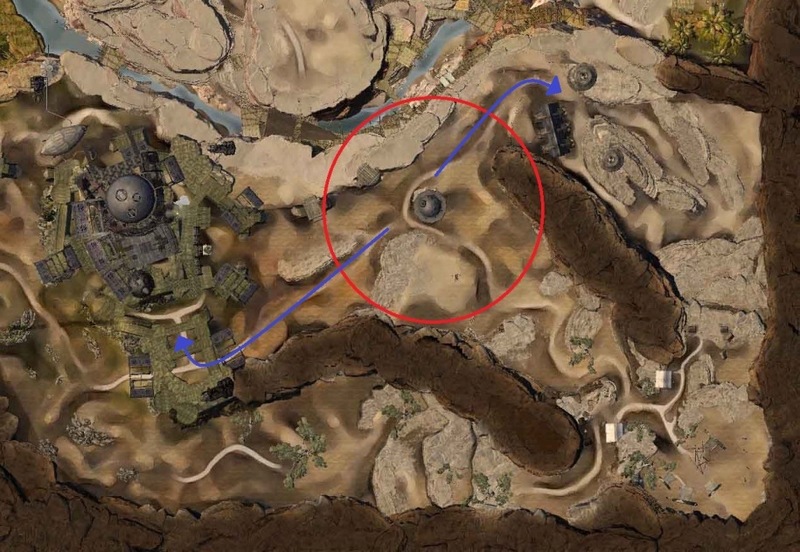 Due to the Desert Borderland design, many players are getting lost. The best way to learn this map is to do it section by section. Now as a Sentry, I like to camp out at Sentry Points, due to the platform that can be used to spot enemy forces, its minimum PPT importance, and distance between both its respected supply camp and tower. At the start, I suggest building a Stealth Disruptor Trap on the watchtowers staircase. This will prevent most solo thieves getting the drop on you since the platform is too high for them to shadowstep up to, so they will have to take the stairs. Then either a ballista or an arrow cart can help you out also. The ballista range will help you take shots at any roamers or havoc groups trying to skirt around the tower, and the arrow cart is a great fire support for any of your team who wants to tackle the enemy on the ground. The red circle is about the range of a ballista on top of the watchtower, it normally would be less if it was on the ground, but the height of the platform really helps its range. If either the Supply Camp or Tower come under attack, you can respond to it very quickly from your location. Also you can keep a good eye on the dolyak runs from the watchtower and assist when you see an enemy go for the dolyak. I'm sure people will frown upon setting up camp so close to the spawn, but this is just an example. But if a sentry is stationed here, they can shout out the warning if an enemy zerg comes into the map before they hit anything major. This is a new kind of map, so we need to start doing a new type of game plan. Now in one hour of doing this solo, I was able to get up to ten kills, a few from the same people and successfully keep both the tower, camp, and sentry safe. I was finally ousted by a group of four, but that was only due to numbers. I did try this with two to three others, it was a roaring success, and the players really enjoyed using the ballistas and running down the roamers and havok groups. We were ousted by a [dcon] zerg of twenty, but I think they were there because we held the Eastern Keep from them for over three hours that day from their zerg of fifteen and they were not happy about that. If you have a group of two to five that want to do this, awesome. You can add in a few patrols to catch any enemies attempting to slip past or make the watchtower into a deadly fortress. I suggest having a Ranger/Druid or a Dragonhunter along to trap the stairs or ramp up to your platform. This can really be nice for anyone working on Leader of the Yak, since you'll be sitting right on a caravan route, so you'll get a bronze for any dolyaks that walk by. If a you see a force too large for you or your team to deal with, I suggest falling back to the closest Tower, contacting the online commanders, and bunker down. This is one of my many ways I'm able to enjoy both WvW and RP at the same time. You are providing a valuable service to the server while getting away while rping. Everybody wins.